There's really no denying it: We humans don't deserve doggos. Not only do our furry family members love us unconditionally, but they're incredibly loyal and affectionate, and their adorable doggy antics can turn a boring, old Monday into the best Monday ever. And, to top it all off, dogs are downright freaking adorable. In honor of our pupper friends, we've rounded up the 25 cutest and cuddliest dog breeds out there—from teeny, tiny teacup Pomeranians, to massive Great Pyrenees. Whether you're having a humdrum workday or just want to add some cute to your day, read on to peep the most adorable dog breeds—and learn some interesting facts about them. Betty White and the entire internet as we know it aren't the only ones who love Corgis; according to Welsh legend, the fairies and elves residing in Wales loved them, too. Stories of Pembroke Corgis pulling fairy coaches, herding fairy cattle and carrying fairy warriors into battle abound in Wales. Don't believe the tall tales? Check out a Pembroke Corgi's shoulders the next time you see one. Some say you can still see the marks of a fairy's saddle around the shoulders of a Pembroke Corgi's coat. Golden Retrievers were originally bred as working dogs, so it should come as no surprise that they absolutely love to have jobs! Because Goldens are hardworking, extremely intelligent, and quick learners, they're often used as hunting dogs, rescue dogs, and even therapy dogs in hospitals and care facilities. In addition to their admirable work ethics, Golden Retrievers' incredibly sweet personalities make them the perfect pick for therapy or comfort dogs. They can bring some much needed comfort (and cuddles) to those who have experienced traumatic events or people living in medical care facilities. What's better than a big, cuddly doggo? A big, cuddly doggo who delivers fresh cheese and bread. Enter: The Bernese Mountain dog. Back in the 1850s, cheese plants started to pop up all over Switzerland, and producers wanted an affordable, easy way to deliver fresh batches. Bernese Mountain dogs, who are known for their incredible strength and intelligence, would pull carts of fresh cheese and bread to buyers at different shops and farms—oftentimes navigating their route entirely on their own. Grab your lab coat and get ready for some fascinating biology about Siberian Huskies. These gorgeous canines can run for hours upon hours without stopping or food and without tapping into their bodies' carbohydrate or fat stores. So, how can they burn so many calories without replenishing? Huskies regulate their metabolisms for extreme performance. Huskies were bred to run long distances in cold, harsh conditions, so it makes sense that their bodies were built for performance. But it's still pretty amazing, right? It's common knowledge that Beagles are A+ hunting dogs, but did you know that their ears can actually improve the performance of their noses? Beagles' long ears catch scent particles and keep them close to their noses, so they can process as much information as possible while on the hunt. Thanks to their massive size but incredibly gentle, nurturing natures, Great Pyrenees were originally used as guard dogs for flocks of sheep. While the shepherd slept, the Great Pyrenees would stand guard overnight. Because Great Pyrenees took the night shift, they're naturally nocturnal—even today. Many Great Pyrenees puppy parents might find that their dog is most active at night. Today's Pomeranians have a somewhat "prissy" reputation, but early Pomeranians were originally herding dogs that pulled massive sleds over rough, snowy terrain—if you can believe it. Back then, Pomeranians weighed about 30 pounds and were packed with muscle—a major contrast to today's petite pooches. Pomeranians were bred to a smaller, lap dog size some time during the 19th century. Despite their name, Australian Shepherds do not hail from Australia. In fact, it's commonly believed that they originated in the Basque region of the Pyrenees Mountains, a massive mountain range bordering Spain and France. Because the Basque region of the Pyrenees Mountains is so small, it's said that shepherds traveled the globe, with their herding dogs in tow, to find more work. They eventually landed in the United States and Australia, hence the name Australian Shepherds! There's much debate on the history of hot dogs (yes, really), but some believe they were originally called dachshund sausages—a loving homage to the German Dachshunds. German butchers often kept Dachshunds in their shops, so the theory makes sense, right? Known for their sweet smiles (otherwise referred to as "Sammy smiles") and massive, fluffy coats, these gorgeous, marshmallow-y dogs aren't all just good looks—they're incredibly hardworking, too. Samoyeds were originally bred by the Samoyede people of Persia to pull sleds across harsh, snowy terrain on long hunting expeditions. But according to some historians, Samoyeds were loved by their owners, too—and treated like members of the Samoyede family. Goldendoodles, a "designer' breed that's produced by breeding a purebred Poodle with a purebred Golden Retriever, are extremely intelligent, friendly, energetic, and (duh) adorable. But one of the biggest draws of Goldendoodles? Many are hypoallergenic, meaning they won't cause a reaction in someone who is allergic to dogs—and they don't shed nearly as much as a standard Golden Retriever. It's a win-win-win! 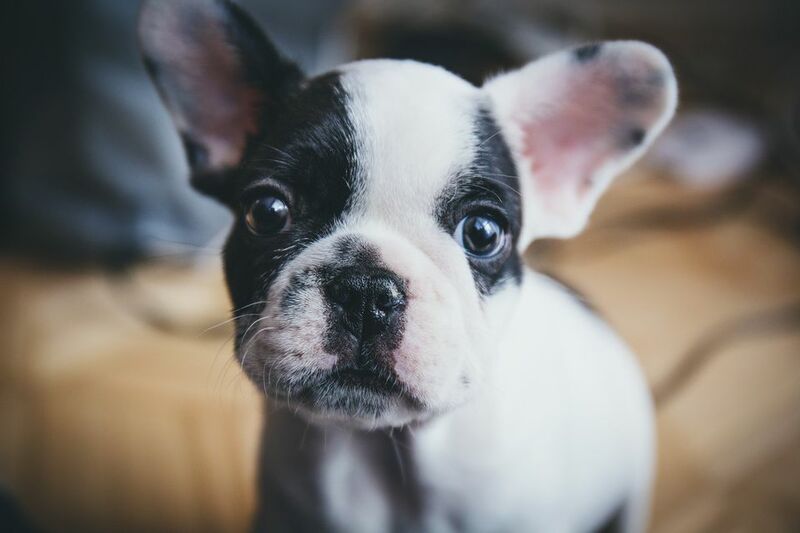 Like many dogs, French Bulldogs were bred with a very specific job in mind—but they weren't herding animals, hunting or guarding flocks. French Bulldogs, a cousin to the English Bulldog, were actually bred to be little climate controllers for English artisans working in chilly shops. The Frenchies would sit in their laps while they worked, keeping them cozy against harsh winter weather. But why are they called "Frenchies" if they originated in England? When the Industrial Revolution hit England, the work of artisans was no longer needed—so they moved to France, where their skills were still in high demand. It wasn't just Pilgrims that came to America on the infamous Mayflower voyage—America's first Cocker Spaniel arrived in Plymouth, Massachusetts back in 1620, too. Over the next two hundred or so years, the medium-sized dog gained massive popularity among settlers for their hunting skills, intelligence, and friendliness. Eventually, in 1878, the first Cocker Spaniel was officially registered by the American Kennel Club. These days, Yorkshire Terriers have somewhat of a reputation as lap dogs or pooch purses—but back in the day, these petite pups worked hard to keep businesses, mines, and other workspaces pest-free. Their small stature enabled them to squeeze into tight spaces to chase after mice, rats, and other rodents, and their big-dog superiority complexes made them fearless when it came to the hunt! What, exactly, is a Maltipoo, you ask? It's the absolutely adorable result of breeding a Maltese with a toy or miniature Poodle. And these pint-sized puppers are blessed with the best of each breed: They're extremely sweet, like Maltese, and very intelligent, like Poodles. German Shepherds are working dogs, so they love to have a job. It's super common to see them employed as search and rescue dogs, police dogs, and firefighter dogs—but did you know the very first seeing eye dog was a German Shepherd? After undergoing rigorous training, Buddy became the world's first guide dog in 1928. Despite their name, Old English Sheepdogs actually aren't a very old breed. Hailing from the southwestern counties of England, these shaggy dogs are only a few hundred years old—a timeline that pales in comparison to ancient dog breeds, like the Great Pyrenees (originating around 3000 B.C.) and the Maltese, which was beloved by ancient Greeks, Romans, and Egyptians. Out of all the dog breeds, pit bulls are often the most misunderstood and misrepresented ... and the misconceptions begin with their name. "Pit Bull" isn't actually a breed—rather, it's a category for a number of breeds, like the American Pit Bull Terrier, American Staffordshire Terriers, and other dogs with similar physical characteristics. From their super sweet personalities to their slobbery, happy smiles, there's a lot to love about Labrador Retrievers—and their ranking as the American Kennel Club's top dog proves it. Labrador Retrievers have been the number one dog in America for an incredible 24 years, longer than any other breed of dog in the history of the American Kennel Club. Talk about some serious bragging rights, huh? There's something to a Chow Chow's sweet smile—and that je ne sais quoi is actually two extra teeth. While most dogs have 42 teeth, a Chow Chow's chompers clock in at 44. In Tibet, the country from which Lhasa Apsos hail, Tibetan Buddhists believe that rebirth as a dog comes just before rebirth as a human in the stages of reincarnation. In fact, according to these Buddhists, Tibet priests called lamas are often reborn as Lhasa Apsos right before they're reborn as humans. There's no denying that long-haired Chihuahuas are freaking adorable, but there's more to these pint-sized pups than beauty—they've got some serious brains, too. In terms of brain-to-body size ratio, a Chihuahua's brain is bigger than any other dog's. Do you know why Dalmatians are the go-to doggo for firehouses across the globe? Back in the day, when firetrucks were pulled by horses, Dalmatians had an integral role in keeping the horses calm, cool, and collected as they approached the fire. As a bonus, Dalmatians also make excellent ratters, so they keep firehouses pest-free. Only 12 states boast a state dog, but there's no dog more synonymous with his state than the Boston Terrier. The small breed was named the official canine of the Bay State back in 1979 and still hold the honor today. Did you know Maltese are one of the world's oldest dog breeds? Originating around 900 A.D., they've been depicted in artwork and written about in transcripts from many ancient civilizations, including the Greeks, Romans, and Egyptians.